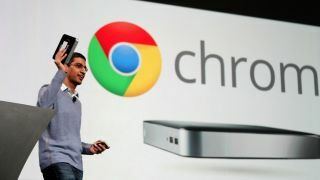 Good news if you were waiting to get your hands on the new Series 5 Chromebook and Series 3 Chromebox. Both devices will be available at Best Buy stores all over the U.S. starting today. The announcement was made during the second day of the Google IO 2012 conference by Google's Senior Vice President of Chrome and Apps Sundar Pichai. Samsung's new Series 5 Chromebook and Series 3 Chromebox will feature the latest version of the Chrome OS, which was heavily demoed today during the annual developers conference. In addition to being available at brick and mortar stores in the States, the Chromebook and Chromebox will be available in the U.K. at Dixon's stores, as well. Techradar will get more details as Google IO 2012 continues. In the meantime, check out all of the latest news from the show here.